Bottle trapping is an effective method used in capturing/collecting larger aquatic beetles, primarily dytiscids and hydrophilids. Many of these beetles are strong swimmers and especially the large ones (Dytiscus, Cybister, Hydrophilus, and others), can easily evade a dipnet. 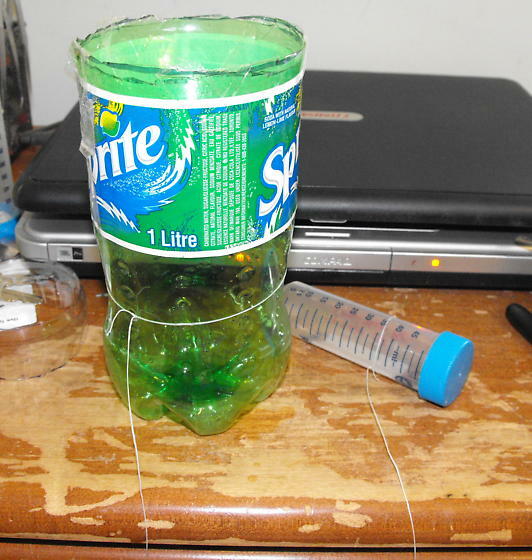 3) tie one end of the string around the bottle and the other around a float (in this case, an empty, closed, plastic tube was used); ensure that there is sufficient distance between the trap and the float such that the float stays on the water surface and the trap stays on the bottom substrate. And done! Now off to the pond (see other images for further explanations). I'm wanting to give this a try but have a couple of questions. I don't see a killing agent listed. Are you live trapping? If so how do you keep the large ones from eating the small ones? And is this a intended as a one-time use? When placed in the water, is it to be standing upright or laying on its side? That could be another option as well. A modified version of this strategy would be to use a light stick placed inside the bottle and leaving it overnight. So far I've found, though baiting is effective, it attracts unwanted critters such as leeches, which can clog up the opening of the trap (those things are also hard to remove as they cling tight!). It may not be a bad thing if you don't care what's going in (leeches are good fish bait) but if you are targetting insects, they can be a nuisance.